Quick. Don’t blink. 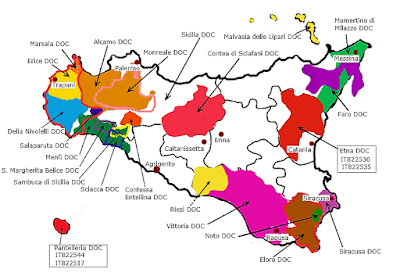 Name a wine grape associated with Sicily. If you said Nero d’Avola, we should share a glass sometime because that has typically been the grape of my thought as well when thinking of Sicilian red wine, and why not? Wine made from this grape offers deep color, satisfying body and sweet-cherry fruit contrasted with some earthiness, a quality of tartness and generous tannins. And we’re not the only ones to so enjoy it. In Sicily, it’s their most consumed and planted red varietal. What could possibly be wrong? Well, unless you’re from Sicily or have traveled extensively throughout the island, you may be unaware that many people refer to Sicily (in wine terms) as being a “continent” instead of an island. It is Italy’s largest region, 1000 square miles larger than Tuscany. It’s super productive, being surpassed only by Veneto. And in terroir and terrain, it’s extremely varied. Mount Etna offers elevation and, of course, volcanic soil and congealed magma in an alpine climate. Near the coast, sea breezes cool the area which inland can be boiling hot warmed by winds from Africa, though at higher elevations diurnal differences are helpful cooling grapes grown at high altitude. So what could possibly be wrong? Sicily’s rich history of viticulture, the popularity of Nero d’Avola there, the influx of Sicilian immigrants to the U.S. and the wine’s eminent compatibility with red sauced dishes (themselves popularized and accepted here) made the wine popular in the U.S. And with Nero d’Avola being Sicily’s most planted grape throughout many differing terroirs, emphasis turned to volume over quality in order to meet demand. Unlike the large D.O. areas of Spain (Rioja for example), and the well-known region of Bordeaux, Sicily’s DOCs are not uber recognized. Nero d”Avola became Nero d’Avola from wherever in Sicily. Blend that reality with the emphasis on quantity over quality and you have a situation similar to that of other varietals that waxed and waned. The turning point came in the late 1980s when Planeta and Regeleali wineries chose to become innovators by matching local soil types to both native Sicilian wine varietals and international grapes. Planeta now has wineries throughout different areas in Sicily so as to take full advantage of being able to vinify grapes soon after being picked from the best terroirs. I had an opportunity to meet with Alessio Planeta, chief winemaker of Planeta and taste several of his wines. In that experience, I enjoyed tasting another indigenous Sicilian grape, as old as winemaking history, and yet new to me. It’s impact upon Nero d’Avola when blended was amazing, as it was when vinified alone. Here are my takes on the tasting. Dorilli Winery in the Vittoria DOC (mid-point between SE and S-central Sicily on the coast) where it grows best in Vittoria’s flat, red sandy soil. Cherry and strawberry on the nose. Reminded me of a young Gamay, though less rustic. Could serve slightly chilled. Silky texture. Light tannins. Tart notes that recede and then reappear on the palate make this wine fun and easy drinking. Fresh and floral with aromatics of rose and citrus. Some balsamic on the palate. Nice acidity makes it food friendly. Cerasuolo di Vittoria DOCG 2014. SRP $24.00. The only DOCG in Sicily and where Planeta houses their Dorilli winery in the heart of the production area near the Dorilli River. 60% Nero d’Avola and 40% Frappato, The Nero d’Avola darkens the blend and aroma and adds body. Nose of light cherry. Medium bodied. Black cherries and strawberries from the Frappato. Dorilli Cerasuolo di Vittoria Classico DOCG 2014. SRP 33.00. Same varietals. Same vintage. Same winery in the same area. But this wine is from selected vines and the blend changes to 70% Nero d’Avola and only 30% Frappato. Grapes undergo 21 days maceration (instead of 14) on the skins. More focused, somewhat dressier and more complex. The nose incorporates cocoa overlaid above the red cherry, strawberry – emphasis on the cherry. Cerasuolo means “cherry like,” after all. Cerasuolo di Vittoria had been a DOC since 1973 but was promoted to DOGC in 2005 acknowledging that these wines were indeed a showcase for Sicily. 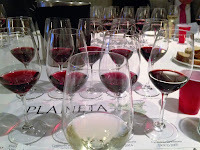 Planeta has consistently demonstrated the potential quality of this wine style, from vines grown in red, sandy and limestone soil as opposed to others in this large delineated area composed mostly of clay. Cerasuolo di Vittoria DOCG 2007. SRP $24.00. 60% Nero d’Avola, 40% Frappato – as in the 2014. These blends are ageable and tasting this bottle demonstrated that fact. Earthy and figgy on the nose, then fading to allow the fruit on the palate to come forward: red berries, strawberry, a hint of ginger. Complex for a wine at this price point. Nocera Sicilia DOC 2015. (To be available soon). Another indigenous grape, Nocera grows only in Sicily’s northern (Messina) area. The grape can be very sweet when ripe without dropping acid, making it ideal for growing in areas of scorching heat. Thanks to its thick-skinned berries, it has prominent tannins and can make ageable, structured wines with some weight. This sampling was 100% Nocera, 100% different and 100% enjoyable. Medium bodied, dark fruit flavors, leather and spice. Intense aroma of black cherry with some kirsch. Tannins well managed. Planeta hand harvests and then further selects grapes at sorting tables in the winery. Nero d’Avola Nocera Sicilia DOC 2014. SRP $26.00. The Nero d’Avola adds cherry and complexity to the blend which matures 4 months in third and fourth use barrique. Starting out ripe and rounded, it builds some grip. From the La Baronia Winery on Capo Milazzo. We moved on to tasting unblended Nero d’Avola DOC starting with the 2012 and moving back through 2011 and 2010. All are produced in Planeta’s Bounivini Winery in Noto (southeastern Sicily). All are 100% Nero d’Avola, but there are minor differences in both maceration and maturation, so they are noted. Noto Nero d’Avola DOC 2012. SRP $26.00. Aroma of chocolate covered plums. Faint earth that recedes into red fruit that carries into taste. Slight volatile acidity, but not obstructive. 24 days maceration on the skins/aging 10 months in second and third use oak. Santa Cecilia Noto DOC 2011. SRP $45.00. As above, but more earthy on the nose. Some volatile acidity, but not obstructive. 21 days maturation, 14 months aging using second and third use oak. several if you can find it. Seamless fruit integration with subtle and balanced aromatics. No volatile acidity. This is polished wine from a very good vintage from a very good winery working with a classic grape. 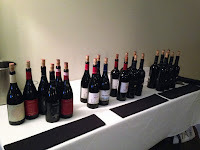 Everything you’ve already read here and elsewhere about Nero d’Avola but on a higher level. 2011: A youngster: still bright with plum, berries, wild strawberry, citrus and a note of carob. Balanced and elegant with a rounded finish. 94 points Wine Enthusiast, 90 Wine Spectator. With an ARP of $24. 2007: A little earthy and herby with garigue, ripe blackberry, plum and dark cherry. Wine Enthusiast 92 points. ARP about $31. 2005: Wild cherries and red berries, plump but balanced with seamless fruit. Restrained and elegant with contrasting herb notes, expresso and dark chocolate. 91 points Wine Enthusiast. ARP $39 – if you can find it. Worth the hunt. Conditions in Sicily are so favorable to viticulture, so long as respect is given to matching local conditions to the specific varietal, that “almost organic” farming is assured. Planeta, a leader in doing this has also been active in working with the “SOStain” project that certifies sustainable winegrowing, and in working with the Italian Ministry of the Environment to study ways of reducing water usage and wineries’ carbon footprints. None of this, though laudable and important, does anything toward helping consumers become more familiar with Sicily’s DOCs. 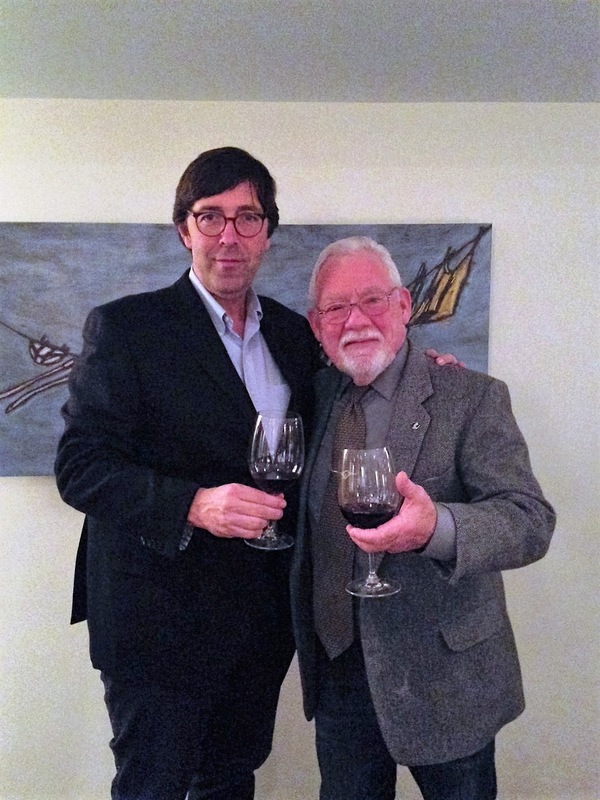 Keeping current in the changing world of wine (Spain is even now considering changes to their system of delineated designations) can be a time consuming effort. A simple approach, at least regarding Nero d’Avola as a varietal or in a blend could be as simple as looking for the word Planeta on the label. If you haven’t yet “liked" Wine Mizer on Facebook, you’re missing out on daily wine reviews, industry news, food pairing suggestions and much more.